I stand in the cellar at Champagne Collet in Aÿ, in the heart of the Champagne region, where one million bottles a year are produced. The historic cellars which were once a refuge during war are now home to some of Champagne’s finest caves, where millions of bottles age for our eventual palatable pleasure. As an attendee at the International Wine Tourism Conference 2015, held this year in La Champagne, France, I was honored to receive a hands-on education in Champagne making and tasting. “The bottles are placed in a 45-degree angle, necks down in the pupitres,” our guide explains, and the riddler turns the bottles every one to three days over a period of several weeks. Referred to as “remuage,” the process of riddling was invented by Widow Clicquot of Veuve Clicquot fame. Today, most Champagne bottles are riddled mechanically, but the ridge-lined shape of this particular Collet bottle does not fit within the parameters of the machine and must be turned manually. A bottle of Esprit Couture was bestowed upon me, and I recently had the pleasure of sharing it with friends. This is a Champagne crafted entirely by hand from start to finish utilizing Collet’s finest crus in a blend of 40 percent Chardonnay (for elegance and finesse), 50 percent Pinot Noir (for depth and structure) and 10 percent Pinot Meunier (fruit flavor). 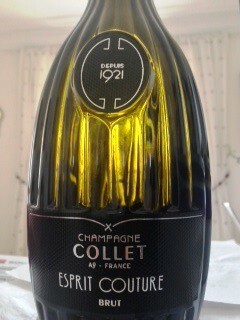 This particular Champagne is aged for a minimum of five years within Collet’s chalk cellars. Upon sipping this amazing bubbly, there was no doubt it was just that… fine effervesces gave way to vanilla and floral aromas with a taste of minerality and citrus blended perfectly for the palate. Perhaps it is in the crafting of a selection of grapes from twenty vineyards in La Champagne, but the delicate aromas and flavors, like melting roses on my palate, wins my praise once I sip Collet’s privee rosé dry Champagne. This is a blend of pinot noir and chardonnay grapes with a bit of pinot meunier for its fruitiness, aged four years in a century-old chalk cellar. The next morning, my tour on the Champagne Trail continues with a half-mile-long stroll on Avenue de Champagne in Epernay, where I walk on top of 200 million bottles of bubbly. Or so I’m told. Thoughts about taste and terroir dominate my mind as I reflect on my journey through the wine regions of France. Author and scholar Barbara Kirshenblatt-Gimblett once conducted research on sensory pleasures in food, citing the fact that “Wine is alive”— “It matures over the years and changes even in a few hours. It is an event. Even a single taste can be like an act in a play that is as long as the life of the vintage.” I would have to agree. To view Collet’s video on Champagne’s tradition, click here.